Sekou Keita, my sponsor child in Mali. 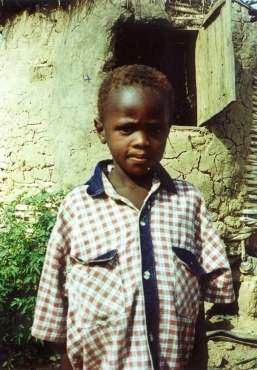 My sponsored child was born in 1994 and lives in Mali, in a village near Kita-Kourou. Mali is in West Africa and contains the location of Timbuktu. Much of Mali is Sahara Desert and only the southern areas are habitable. 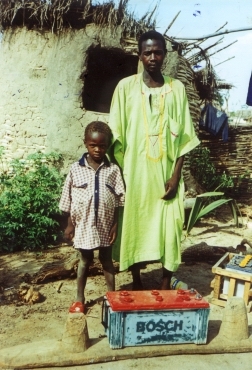 In Mali brot people are Moslem, although they also believe in black magic. Female circumcision and polygamy are also practised. It feels like a world away but they have the same wishes and needs as every other person - to be healthy, fed, housed, educated and employed. For more information on Mali see the Lonely Planet guide. There are also some very revealing photos of Mali here taken by Galen Frysinger. In November 2000, I sent off a form from Plan's leaflet. Within just a few days I received an introductory profile about my new sponsor child and his family. 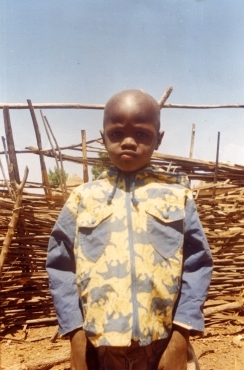 I also received two photographs of him - a small boy wearing a shirt that was slightly too big for him, shorts and shoes. He was standing outside a mud hut with his father - dressed in green robes. 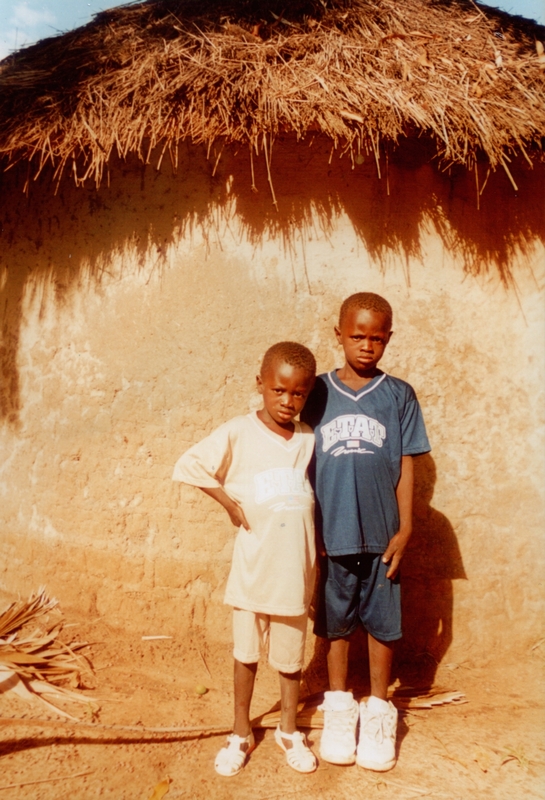 They were both squinting into the sun, Sekou looking decidedly disgruntled to have his photo taken. I later realised they will have dressed in their finest clothes for the occasion. 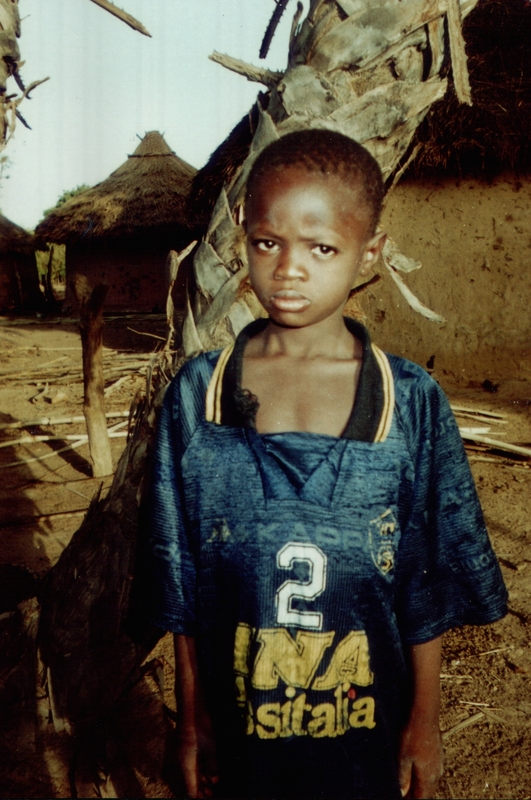 In January 2001 I received a letter dictated by Sekou's father. I replied with a letter, some photos, and I sent an inflatable football from Plan's catalogue. In July 2001 I received another letter this time dictated by Sekou's mother. It seems to take about 6 weeks for a letter to travel in one direction. Shortly after this I received the annual progress report which contained another two photos of Sekou, one alone, one with a younger brother. 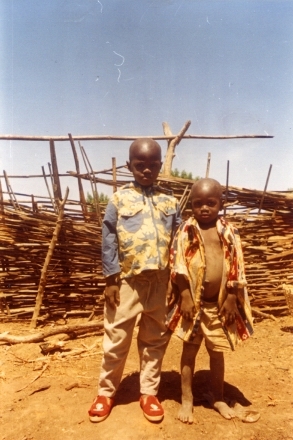 Again Sekou had dressed smartly for the photograph. Now 7, he is taller, and wearing smart trousers and shirt, with the same shoes as before. He and his brother have shaven heads. 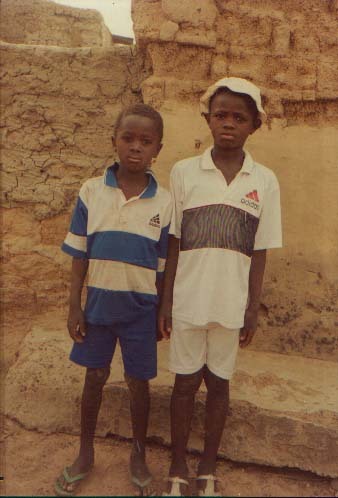 His brother is scruffy and barefoot, wearing a shirt loosely, probably not having prepared for the photo. This time, they are in front of a woven fence. Sekou still looks grumpy to be photographed, he has an endearing little frown that I can relate to! I wrote back in October, this time with some postcards of London and a paper model bus. It looks like our letters have crossed in the post, because in December I received this letter from Sekou's mother, also dated October. It details life for them. I heard from them again in January 2002 and wrote back at the beginning of April. I also received a Cross-Cultural Communication in April. 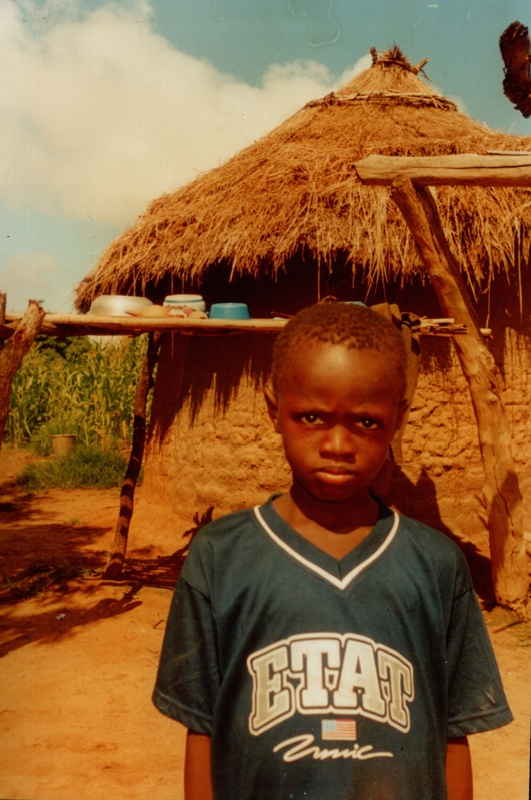 This is a mailing sent from the field team near to my sponsored child. Each year they write about some aspect of their life and culture. In this case it was about Bomo, an annual fishing party. In July, I received a Country Progress Report. 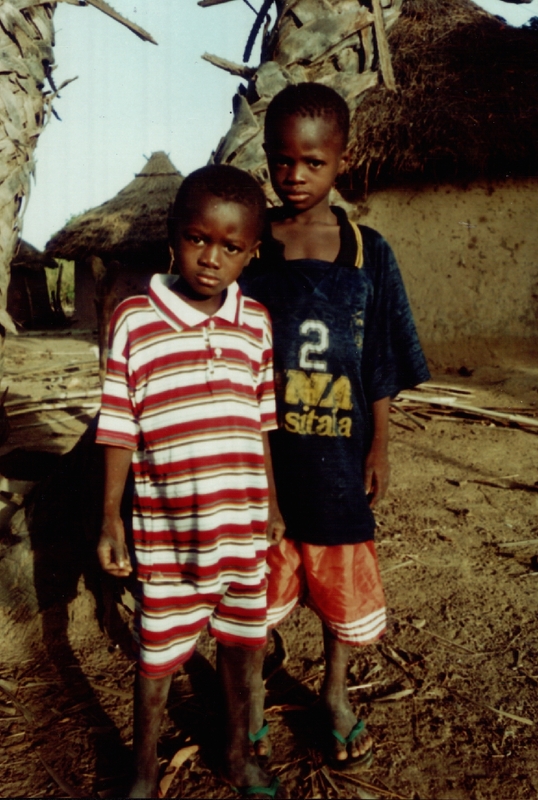 In late July 2002, the annual progress report arrived, along with two more gorgeous photos - one of Sekou, and one of him and his brother. 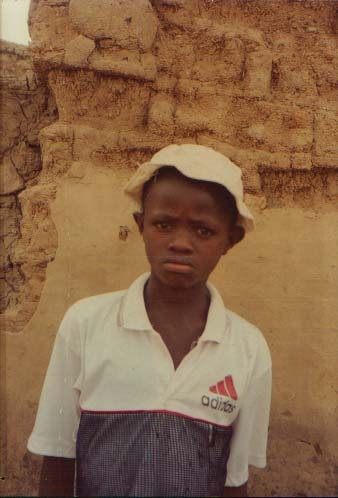 It also came with a community profile of Djidjan and maps of where the family lives. However, some of the details seemed wrong - his family members had all changed, and a few descriptions of the amenities and lifestyle had changed. I emailed Plan and they were very quick to apologise and commission a new report. They explained that the father had left the family for either Libya or Spain, and so the mother had taken the children away temporarily. 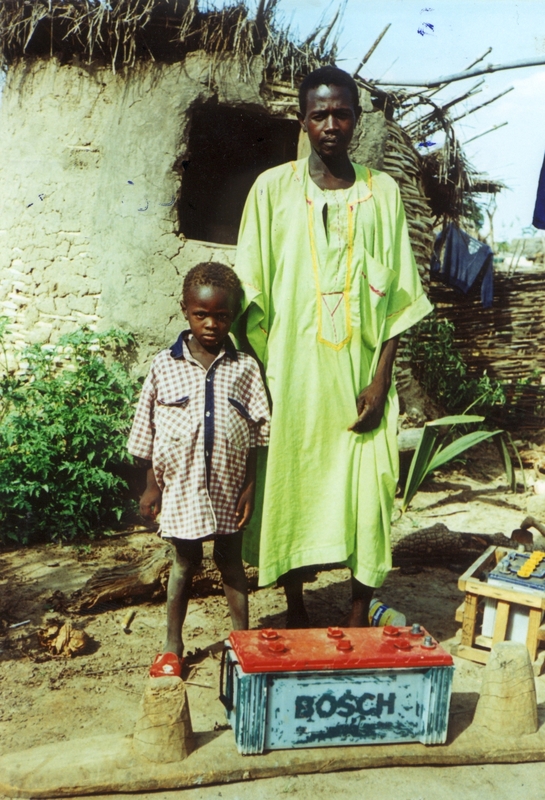 At the beginning of October 2002, the new progress report arrived, which explained who Sekou now lives with. It also came with five new photographs of his family, shown below. Click on the pictures to see them full size. In November 2002 I received a second Cross-Cultural Communication explaining the practise of sending children to live with relatives. 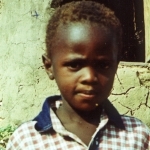 Finally in February 2003 I received not one but three letters from Sekou's mother! The firstis dated November 2002, and updated me on their news. The second is from January and wishes me a good year - they always write at the start of the year. The third is also dated January and has obviously been written just after they received my letter from last April, because they thank me for it and answer my questions. I wrote back at once, answering all the points in one letter. I explained about the seasons here and enclosed photos of the area in different weather. I am now waiting for the next news from Mali. In the meantime I have received the latest update, the 2003 progress report, which arrived in August. 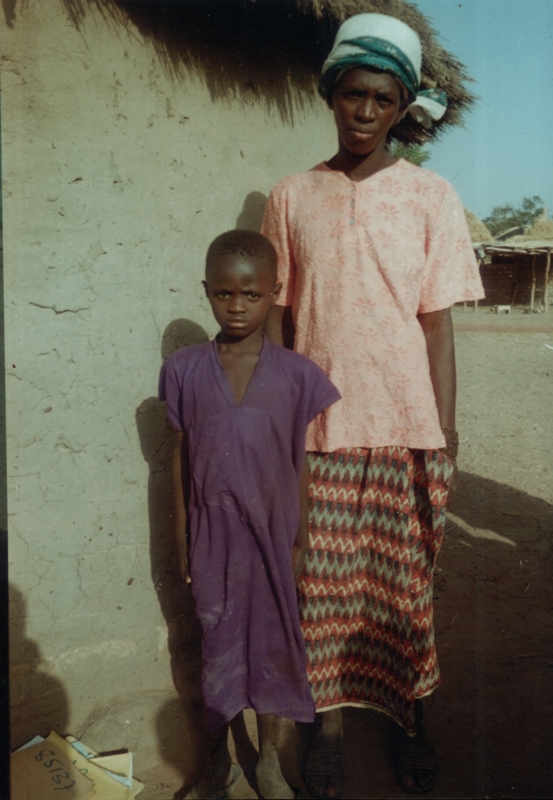 It contained two photos, one of Sekou with his mother and one of him alone, and news on his community situation. I wrote another letter to the family, to share my news, comment on the new photos and let them know I am still thinking of them. 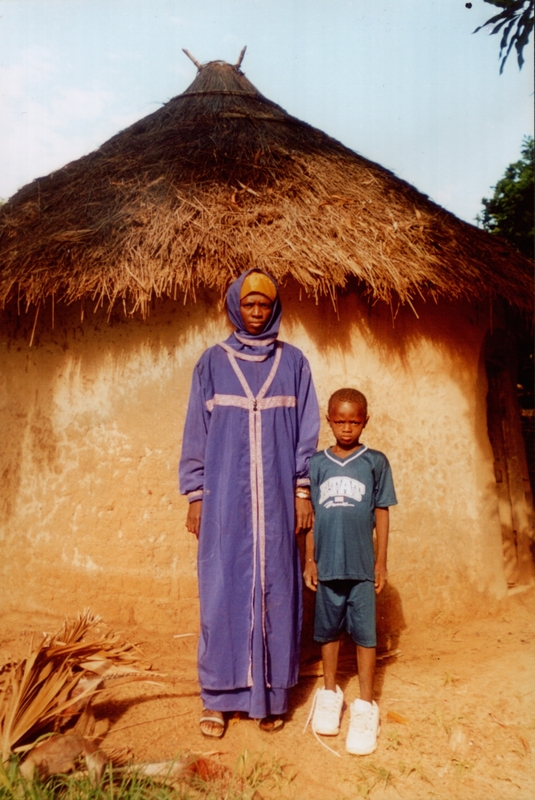 In November 2003 the annual Cross-Cultural Communication arrived, explaining girls' migration in Mali. 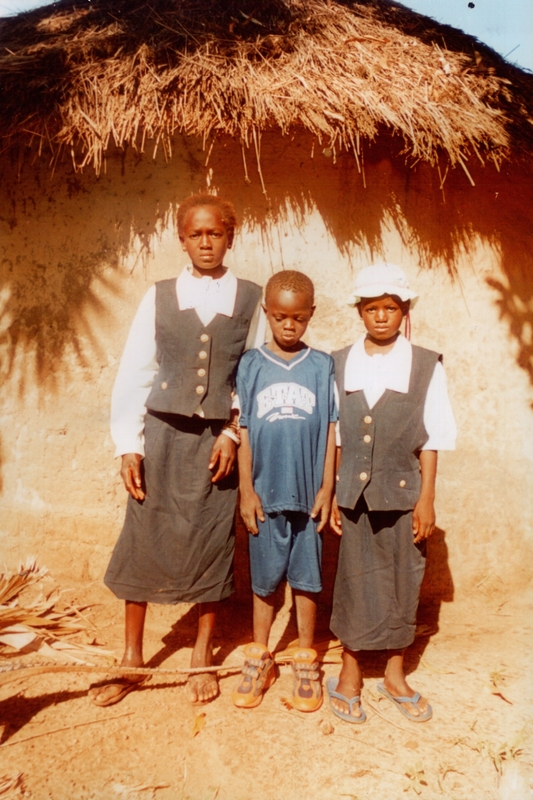 At the end of the month I received a new letter from Sekou's mother. In December I decided to send a letter explaining about our Christmas traditions, to both my sponsor children. Here is the one I sent to Sekou and his family. In February 2004 a letter arrived from Mali dated December 2003 - it looks like they were thinking of me too! 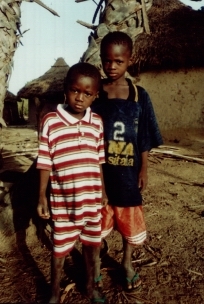 In early August 2004 the annual progress report arrived, along with the photos of Sekou and his brother that I have come to expect. As with every year he looks older and I realise that this is my fourth year of sponsorship. In another four years he will be a teenager, and four years after that, a man. However old he gets he will probably always have the same grumpy pout! In October a letter from Plan arrived containing postcards showing the seasons, so I sent the Autumn one to Sekou and described the weather and how I had just bought a winter coat. 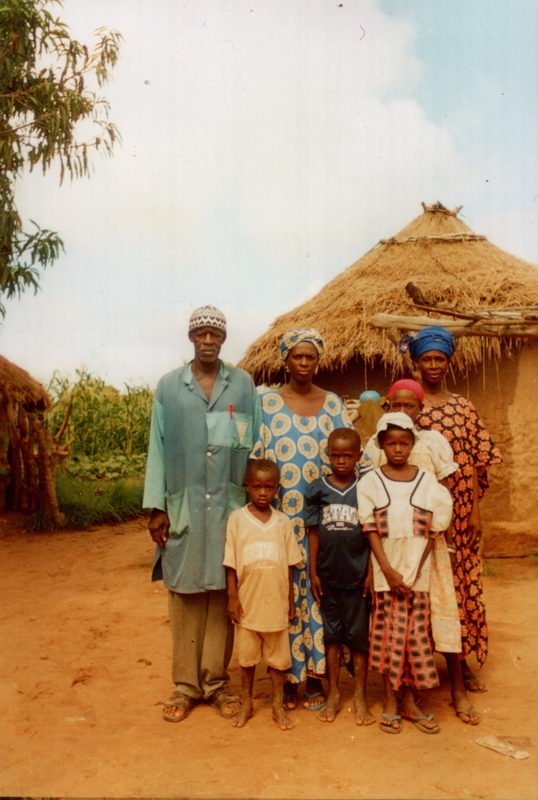 A couple of weeks later, a letter arrived from Sekou and his family. 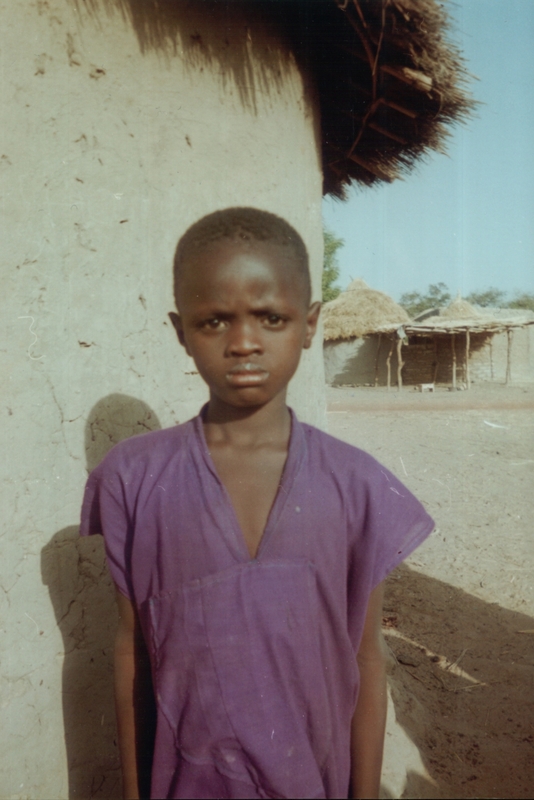 This is the first time that he has dictated the letter himself, and I was pleased to hear he is doing well in school. In February 2005, a letter arrived. It had been written at the end of December to wish us Happy New Year. Then a few days later came another letter which had actually been written first, telling of their crop failure. My turn to write again!